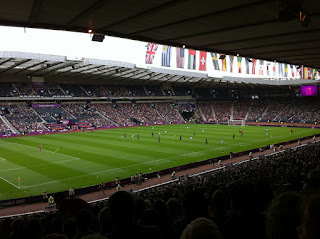 As a fan of Partick Thistle I don't get to make too many trips to Hampden, now that we have been out of Queens Park's league for a few seasons now, so I took the chance to join in the jamboree that is the Olympic Games with my 3 children and went to the Olympic football matches there today. I like the Olympics. The first games that I can remember were Moscow in 1980 with Steve Ovett, Seb Coe, Allan Wells, Daley Thompson and my own personal favourite, Mishka the bear. I've visited cities as a tourist and always made time to see their Olympic stadia; I've walked on the track of the Moscow stadium in a kilt, watched a baseball game at the Montreal stadium, been on the site of the Olympic park in Tokyo, and my all time favourite, Olympia in Greece. Maybe this is why I like the Olympics. It's Greek and I love all things Greek. Travelling alone in Greece one year I got some Dutch tourist to photograph me at the starting line of the ancient stadium in Olympia. So, despite thinking that it is a bit weird still having banners proclaiming London 2012 in a football stadium in Glasgow I eagerly bought tickets for the opening round of the men's Olympic football in Glasgow. As children in the cheap area where we were only page their age in pounds for a ticket, it was a pretty cheap day out too. The much hyped security check was brief and performed good-naturedly by Strathclyde Police, for whom this is a walk in the park compared to an Old Firm cup final day I presume (although thankfully it'll be a while before we are blighted with one of those again I reckon). By chance I had ended up in a nostalgic corner of Hampden for me, from where I watched Rangers defeat Partick Thistle in a Scottish Cup semi-final. It now turns out they were cheating that day with their financial doping chicanery, depriving my team of a cup final day. First up today was Honduras vs Morocco and it was an entertaining game for the neutral observer. Morocco, lead by Houssine Kharja, started better and deserved their lead, a volley from Getafe's Barrada from outside the box. The Moroccan fans were the livelier too, managing to get people going with their drumming. Honduras then scored twice from Jerry Bengsten, first deflecting a Figuera shot home, then from a soft penalty. The Moroccan gamesmanship was becoming a bit annoying at this point. Zakaria Labyad equalised for Morocco with a peach of a chip. 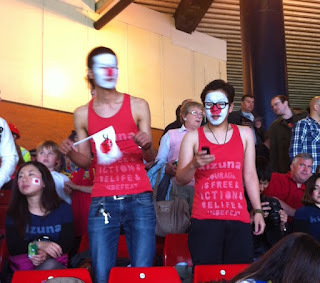 Morocco got a man sent off to complete the entertainment for my son (he loves a red card) but there were no more goals. I was promised on my letter from the Olympics people that there would be a "great variety of food...from filling meals to tasty treats". Eh, no there wasn't. Considering I was locked in the ground for 5 hours to watch two games the options for eating were bloody awful, and the queues ludicrous. Scotch pie, steak pie, chicken curry pie, cheesy bean pie, crisps or Cadbury's chocolate. That was it. Fancy a cool beer to relax in this international sporting gala? Nae chance. Coke, sprite or coffee. Stretching things to describe that as "filling meals to tasty treats". Next up the much anticipated Spain vs Japan game. 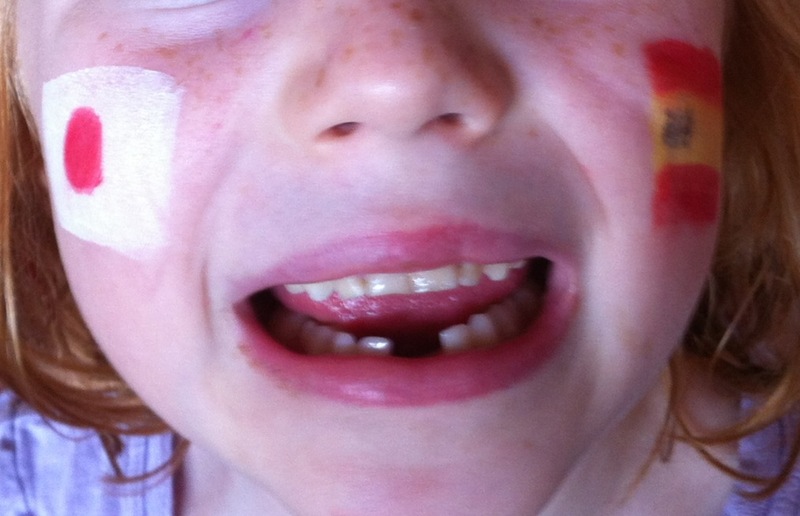 My oldest son has a good friend from Japan so was draped in their flag and face painted with the rising sun, my middle son likes football, and likes Spain, so again face painted and Spain strip on, and my daughter (above) was supporting both teams. Spain, I was glad to see were fielding a strong team with David de Gea in goals, Jordi Alba and Juan Mata on show. 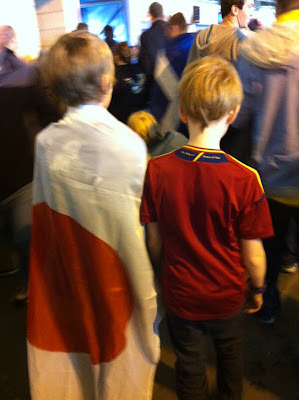 Whilst the ref seemed to be wearing a Spain strip, they were wearing some horrible Man City coloured effort. 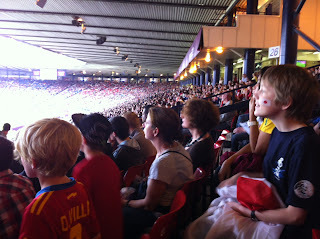 The crowd had filled up now to a respectable 37,000 by the time the game started, with the Japanese fans adding a fair bit of colour and numerous Spain tops being worn by Spaniards and Scots. Despite the chore of a couple of Mexican waves before the match started the crowd were all very jolly, buoyed along by the Japanese drumming section in the opposite corner from me. Spain looked from the outset to be struggling with the expectation on them, whilst the Japanese were attacking entertainingly and took the lead from a corner, turned in by Yuki Otsu. After that Spain struggled with Japan's counter-attacking play and after getting Inigo Martinez sent off for pulling down a free running Kensuke Nagai never looked like equalising. If they were better at finishing or made better choices with their final ball the Japanese could have filled their boots today, and as time went on it was clear that the crowd of neutrals were cheering them on. If Spain want to hold EVERY football trophy in the world game simultaneously they are going to have to pull their finger out. The Japanese had chance after chance to finish the game off and David de Gea had to make more saves than his opposite number. Japan 1-0 Spain it finished and I watched two entertaining games of football, my children had a fun day out and I'm looking forward to taking them back to Hampden next May when Partick Thistle come "to bring the Scottish Cup back home to Maryhill." What I would give for a nice Scotch Pie. Not proven(yet), we still have our trophy's and titles. Sounds like a decent day though. See you in December, back for a few weeks.